Long considered a trusted partner by parents for providing a way to bring healthy food and drink options for kids on the go, Genuine Thermos Brand has brought its superior insulation technology to FOOGO, a line of children's products for ages six months and older. Freshness and safety go hand in hand. If contents are not kept at the right temperature, potentially dangerous bacteria may grow rapidly and cause food and beverages to spoil. All FOOGO stainless steel products feature THERMOS vacuum insulation technology which has been shown to inhibit the growth of bacteria in a laboratory test sponsored by Thermos and performed by Cornell University. For additional peace of mind FOOGO products use BPA-free materials. Thermos brand food jars are beloved by families for their ability to keep food warm or cold on the go. Now there is a food jar for the smallest members of the household. 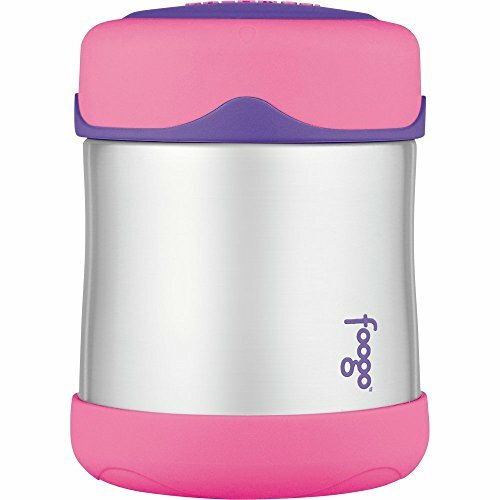 The FOOGO food jar has a 10-ounce capacity and features THERMOS vacuum insulation technology which will keep warm items warm for up to 5 hours or cold items cold for up to 7 hours. Thanks to the durable double wall stainless steel construction and vacuum insulation, this food jar stays cool to the touch with warm foods and sweat-proof with cold foods. The FOOGO food jar features an ergonomically-designed lid with a rubber grip that is easy to handle and open. It has a wide opening making it easy to fill, eat from and clean. Ideal for packing fresh, healthy foods and snacks, the FOOGO food jar is sure to become a favorite on-the-go meal companion. Care is simple: to clean, hand washing is recommended for best results, or top-rack dishwasher safe.